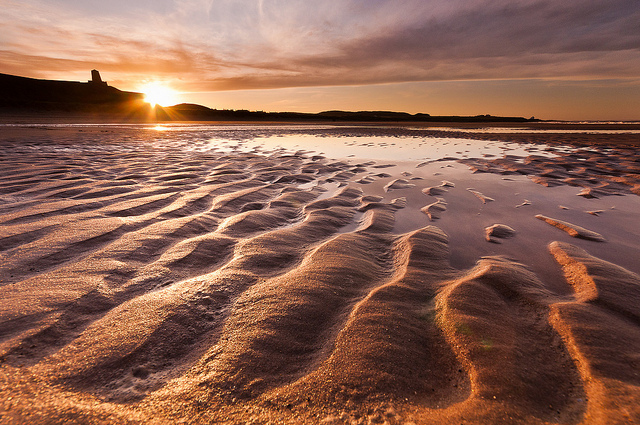 Northumberland has over one hundred miles of unspoilt beaches along its golden sands coastline. Surrounded by natural beauty, rolling dunes and swells you can fit a bus inside, Northumberland is a great place to go surfing, and because the area is not overly developed with tourism the beaches are virtually barren. So if you want to go surfing in the north of England rent one of the many cosy holiday cottages in Northumberland, wax down your surf board and prepare to rule the waves of Britannia. Watched over by the dominant cut of the castle on a cliff-top horizon, Bamburgh beach is the most consistent spot for surfing in Northumberland. The northerly swell is aided by the nearby Farne Isles which causes massive rips about a mile south of the castle. The best spot for surfing at Bamburgh though is the sand bar straight out from Wynding car park. On its day, Beadnell Bay beach is a world-class surfing spot. With views looking out to the Cheviot Hills this beautiful stretch of coastline is a pleasure to visit in its own right – but get it when the swell is right, there is no better place in the north of England to surf. The only problem is the swell is inconsistent and only works if the waves are hitting at least 5 feet. Three hours either side of high water it is not unusual to find a swell between 8 and 10ft so should only be attempted by experienced surfers. Best times to go are April and May, September to November. In winter the waves are good, but the water is icy cold. The beach at Newbiggin by the sea is a quaint sandy stretch with rocky outcrops and an offshore reef. It´s a very quiet spot so you can pretty much expect to have a lot of water for yourself. 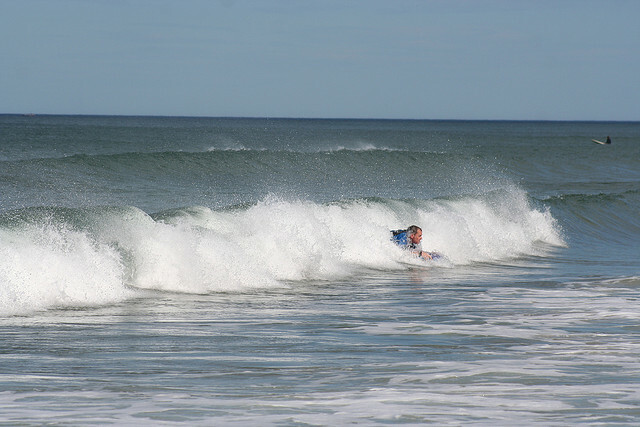 Surf the church to the south of the bay and you should find a decent reef break. If you walk to the end of the brig you can paddle out from there. The north is inconsistent and needs a big swell to work. Blyth beach gives you a couple miles of coastline and you can guarantee that at least one part of it will make for a decent surf session. Avoid the north as the pier tends to cut the surf as you near the shoreline, but elsewhere the swell is steep and hollow and surfable. The problem is it´s difficult to say where you will find it until you get there. Take binoculars. Seaton Sluice forms part of the Blyth beach stretch and is best visited in winter and spring around mid-tide. It´s a reasonably exposed beach which causes inconsistent surf, but when the wind is coming in from south southwest it generates a pretty decent swell. For a quintessential English experience combine your surfing extravaganza with a stay in traditional holiday cottages in Northumberland. Image credits: Vaidotas Mišeikis, John Cooke.